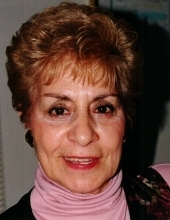 Lena Bontempo of Delran, NJ died November 11, 2018. Age 90. Beloved wife of the late Anthony Passaro and the late Anthony Bontempo. Loving mother of Anthony Passaro of Delran, NJ; Lisa Greaney of Delran, NJ and the late Vincent Passaro. Devoted grandmother of Dawn, Billy, TJ, Dani and the late Kevin. Devoted great grandmother of Kevin, Nicholas, Jack, Taylor and Lilly. Dear sister of Tommy Mastrocola (Kathy) of Cheltenham, PA. Viewing Friday morning 9 to 10:45am in The Schetter Funeral Home, 304 W. Marlton Pike, Cherry Hill, NJ 08002. Funeral service Friday 11am. Interment Calvary Cemetery, Cherry Hill, NJ. To send flowers or a remembrance gift to the family of Lena Bontempo, please visit our Tribute Store. "Email Address" would like to share the life celebration of Lena Bontempo. Click on the "link" to go to share a favorite memory or leave a condolence message for the family.